Bird, Bird, Bird is follow-up to the wildly popular Trout, Trout, Trout: A Fish Chant celebrates American birds and bird diversity in general through a wild chant of their common names. This nonfiction text—illustrated whimsically by Gary Locke, an extraordinary illustrator—will make you laugh. Backmatter includes fun facts about each kind of bird featured. For English/Language Arts and Science Standards see the standards page. You can follow any responses to this entry through the RSS 2.0 comment feed. You can leave a response, or trackback from your own site. 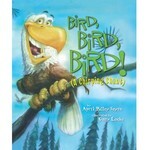 For a bird story hour, combine this with my other bird books: If You Should Hear a Honey Guide Vulture View Home At Last: a Song of Migration Secrets of Sound: Studying the Calls of Whales, Elephants, and Birds The last one is for advanced reading but kids may enjoy excerpts and the full color photos.